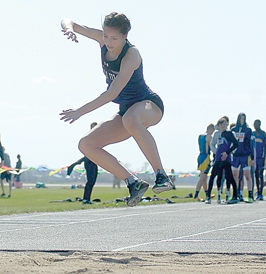 SLEEPY EYE — The Minnesota Valley Lutheran /New Ulm Cathedral girls’ and boys’ track and field teams swept the Sleepy Eye Invite on Monday. On the girls’ side, MVL won with 212 points, followed by Mankato Loyola (79), River Valley (76), St. James Area (63) and Yellow Medicine East. For the boys, MVL won with 147 points, followed by YME (110), St. James Area (99), Loyola (85) and River Valley (25). MVL’s Hannah Marzinske won the 200-meter dash in 28.23 seconds and Mia Johnson won the 3,200-meter run in 13:17.02. MVL’s 4×400-relay team of Abby Nelson, Naomi Anderson, Nicole Portner and Emma Nelson took first in 4:35.8. Kaylee Hunter won the long jump (15 1/2) and took second in the long jump (32-2 1/2). Abby Nelson won the 1,600-meter run (5:38.17) and the 800-meter run (2:40.92) and was second in the discus (86-5). Mara Weisensel won the 100-hurdles (17:19) and Lexi Fosburgh won the 100-meter dash (17:19) and Anna Schwartz was second in 13.68. The MVL 4×100-relay team of Hunter, Livia Reinarts, Sonja Rygh and Nicole Porter took first in 54.63 and Naomi Anderson won the 400-meter dash in 1:07.83. MVL’s 4×800-relay team of Johnson, Maggie Fliszar, Jayda Helget and Claire Fischer took second in 10:59.06. On the boys’ side Izayah Harrison won the 100 in 11.2 and the 4×200-relay team of Christian Edwards, Jon Adema, Caleb Dewitt and Sam Barbosa won in 1:38.61. The 4×100 relay team of Jacob Haala, Joey Goeglin, Eric Furth and Nick Bleick won in 46.62. Robert Rauh won the 400-meter dash (55.41) and Trent Fluegge took second in the 110-hurdles (18:27). Christian Edwards was second in 100 (no time given) and Carlos Ramirez was second in the long jump (17-10.25). Jake Kettner won the long jump (17-11) and the triple jump (36-11.25) and he finished second in the high jump (5-10). 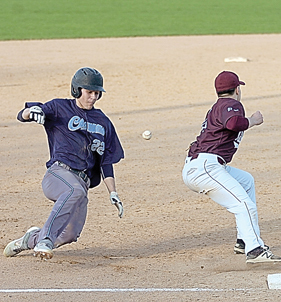 LAKE CRYSTAL — New Ulm Cathedral’s Will Schabert had a big day at the plate, going 3-for-3 with a double, two runs scored and five RBIs to lead New Ulm Cathedral past Lake Crystal-Wellcome Memorial in a nonconference baseball game. Aaron Portner was the winning pitcher, going three innings and allowing one hit. He struck out seven. Tony Geiger and Schabert each pitched an inning. Noah Wilmes went 2 for 4 with an RBI for the Greyhounds. Alex Hillesheim, Geiger and Portner all scored three runs and Sam Knowles scored two runs. Cathedral (3-2) is at Wabasso next Tuesday. SPRINGFIELD — Springfield and Wabasso split a Tomahawk Conference doubleheader on Monday. In the first game, Mya Mickelson led the Tigers with two hits. Sarah Dunn, Taylor Augustin, Kendall Kelly, Grade Pingeon, and Chassidy Vanderwerf each added one hit. Brittany Rogotzke started for the Tigers and threw five innings, giving up five runs on three hits, walking five and striking out five. Mariah Kirschstein got the win, pitching the final two innings, allowing one run on five hits, with three strikeouts and no walks. 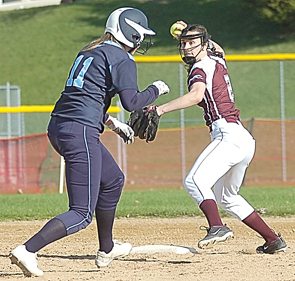 For Wabasso, Megan Rothmeier was 3 for 4, Halle Huhnerkoch had a pair of hits and a walk. Jenna Frank had a pair of hits and Kelsey Frank walked three times. In the second game, Mickelson was 2 for 3 with a double for the Tigers. Liz Johnson, Megan Ploeger, and Pingeon each added one hit a piece. Jaeli Richert took the loss, pitching four innings giving up six runs on five hits, four walks and striking out one. Sarah Franta got the win on the mound and was 3 for 3 at the plate with a walk. Megan Rothmeier had a double for the Rabbits. Brittany Rogotzke pitched the last two innings in relief. Wabasso (1-4) is off until April 23rd when it hosts New Ulm Cathedral.